In 1941 the largest single massacre of the Holocaust took place at Babi Yar, a ravine in Kiev. In just 2 days almost 34 thousand Jews were murdered by a team of German SS troops, other German units, and local collaborators. On September 29 the Nazis ordered the Jewish population of Kiev to assemble. They believed they were being resettled to labour camps. The Nazis expected only 5,000 Jews to assemble, but more than 30,000 arrived. The Jews were forced to hand over their valuables and take off all their clothes. They were then escorted to the ravine at Babi Yar in groups of ten. On reaching the edge of the ravine they were shot by the Nazis. 33,771 Jews were executed over a 2 day period. Over the next few years the Nazis killed thousands more at Babi Yar. Gypsies, communists, Soviet prisoners of war all met their fate here. Before the Nazis retreated from Kiev they attempted to conceal evidence of the atrocities committed at Babi Yar. In August and September 1943 more than 300 prisoners were forced to exhume and burn the corpses. Babi Yar is now a public park. 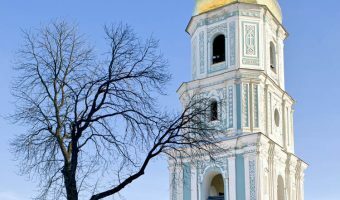 It can be reached by travelling to Dorohozhychi Metro Station. There are various memorials at Babi Yar. To the south of the station is a large monument erected in 1976 memory of Soviet citizens and prisoners of war. Soviet policy didn’t recognise fate of the Jews. North of the station is a monument to the children killed here (erected 2001) and a monument specifically recognising the fate of the Jews (the Menorah Monument – 1991). Map showing location of Babi Yar. The large monument is quite impressive but the ravine where the actual massacre took place is on the other side of the road. There’s little to see at the ravine as it’s now completely full of trees. I think they could do a little more to pay respect to the people that died here. It looks just like a wooded park. There’s nothing to explain what went on here. Short film made by ourselves showing Babi Yar as it is today. 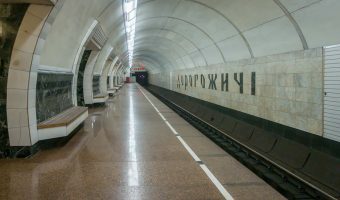 Guide to Dorohozhychi Metro Station.